Pavé diamond ball-bead and rondelles. 3.6 total diamond carat weight. 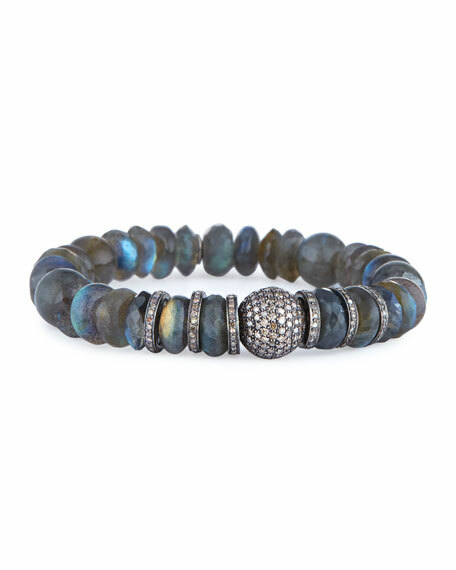 Armenta beaded bracelet from the Old World Midnight Collection. Round 10mm labradorite beads. Blackened sterling silver and 18-karat yellow gold. Armenta beaded bracelet from the Old World Midnight Collection. Round 10mm labradorite beads. Blackened sterling silver and 18-karat yellow gold. Bezel-set champagne diamonds trim rondelle spacers. 0.91 total diamond carat weight. Adjustable pull-cord closure. Made in the USA. Sydney Evan iolite and angel wing bracelet. 14-karat white gold logo and wing charms. Single angel wing with diamond pav??. Sydney Evan iolite and angel wing bracelet. 14-karat white gold logo and wing charms. Single angel wing with diamond pav??. 12mm smooth, round multihued iolite beads. 0.16 total diamond carat weight. Charm, approx. 7/8"H x 3/8"W. Slip-on style. Imported. Sydney Evan celestial medallion and gold bracelet. Polished 14-karat yellow gold beads and hardware. Diamond pav?? crescent moon and star medallion. 8mm smooth round yellow gold beading. 0.026 total diamond carat weight. Approx. 2.5" diameter. Slip-on style. Imported. Sydney Evan larimar beaded bracelet with Moroccan star. Polished 14-karat white gold and smooth larimar beads. Open micro-pav?? diamond Moroccan star dangle. 8mm multihued blue round smooth larimar beads. 0.18 total diamond carat weight. Stretchy; slip-on style. Approx. 6.5"L. Imported.